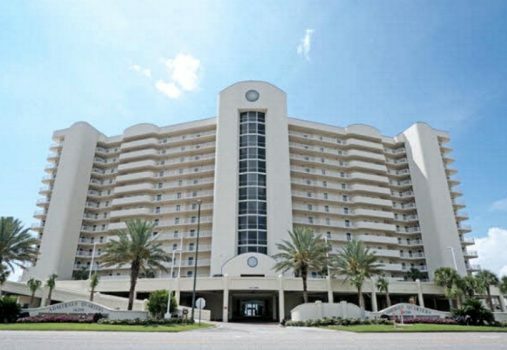 Admirals Quarters condos in Orange Beach offer open floor-plans overlooking the incredible Gulf of Mexico. Each residence has direct gulf-front views from the private balconies. All of these resort homes include jetted-tubs in the master baths – the complex features an indoor pool, exercise facility, sauna, a 100′ gulf-front pool and more. This development overlooks 400′ of white-sand beach and is convenient to dinning, shopping and entertainment. Orange Beach is a coastal community on the white-sand beaches of Alabama’s Gulf Coast, just east of Gulf Shores; the semitropical Orange Beach weather makes for hot, humid summers, with cooler winters and 50-plus inches of rain annually, combined with the Gulf of Mexico, high humidity is the norm during the popular summer months. Thunderstorms are a frequent occurrence in the summertime, but they are generally brief with sunshine quickly returning. Winter, by comparison, is delightfully much cooler and drier, with perfect conditions for outdoor activities.